A new royal animal welfare society has been set up that promises to humanely tackle Bahrain's stray dog problem. The Royal Society for Animal Welfare, headed by Shaikha Marwa bint Abdulrahman Al Khalifa, plans to open a shelter near Al Areen Wildlife Park and Reserve by the beginning of next year that will have the capacity to care for more than 1,500 animals, said a report in the Gulf Daily News (GDN), our sister publication. It also plans to bring in expert teams from abroad to advise on a neutering and spaying programme for stray dogs, which will be implemented over the next two years. However, its first act has been to offer support to the farm where dozens of goats and sheep were reportedly killed in a feral dog attack on Friday. 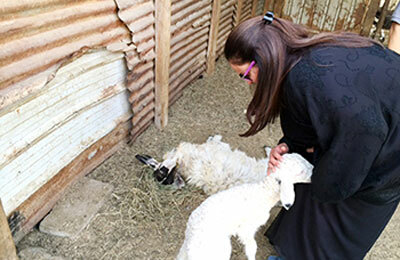 "It is very sad to see these poor farmers suffer as well as their animals," said Shaikha Marwa, who is also a volunteer with the Bahrain Strays animal welfare group. "This was the fourth attack on the same farm within a month and I feel for the farmers - but at the same time the stray dogs should not be tortured, killed or treated in an inhumane way. "We support all the farmers and encourage people not to abuse any animals. "We ask them to leave the problem of stray dogs with our society to deal with. "If they have any complaints we will help them at any time and any citizens can also send us their complaints on our special email address." Ali Al Maqabi, whose family farm in Saar was at the centre of Friday's attack, thanked Shaikha Marwa for her pledge of BD1,500 ($3,976) in compensation to rebuild fences and for veterinary care. "I am very happy that the Shaikha is going to help build new fences for the farm to keep away the stray dogs," said Al Maqabi. "She called the workers and they are currently here to take measurements and help build new solid fences that will protect all of my animals." The 47-year-old farmer told the GDN that 25 of his sheep were killed outright in the attack, with 10 more badly injured. Many of the dead were lambs, while one two-week-old did survive but is now being fed on powdered milk as its mother was not so lucky. "This is my way of life that is under threat - but I will not kill the dogs after the Shaikha helped me," said Al Maqabi. "I cannot do something bad if people are good to me." Shaikha Marwa told the GDN that her society's new shelter would work to house and rehabilitate stray dogs, with the aim of preventing such incidents in the future. "The treatment for these dogs is not death but rehabilitation," she said. "We currently keep them on private property but by the beginning of next year will have a shelter where we can hold more than 1,500 animals.